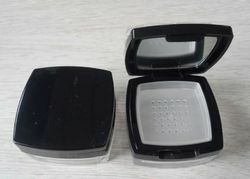 We are Manufacturer of Powder Case . 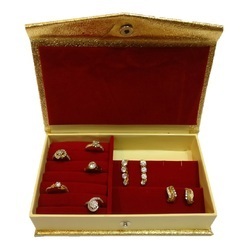 Our product range also comprises of Plastic Jewellery Box, Plastic Glass and Plastic Jar. About the Product: Handmade with Durable Premium Quality and Sophisticated Look. Accommodate Earing and Ring Folder LxBxH (cm)- 17.5X10X3.5. Keeps in upto 4-20 Earings & Rings. Color - Gold. Closure - Snap Button. Pocket Size Travel Friendly Keeps delicate Jewellery safe and dust free A perfect gift Durable, lasts for years. Available with us, is a unique collection of personalized cosmetic cases that is aesthetically designed to assure a classy appearance. Exhibiting the features of high tear strength and crack resistance, these Leather personalized cases are offered to our clients in standard and customized specifications. Being a customer oriented enterprise, we are engaged in providing a wide array of Cosmetic Organizer. A necessity bag for traveling, vocation. This cotton and silk patterned cosmetic bag is well-cushioned to protect your makeup and/or accessories!Measurements: Length 10" x Width 3" x Height 7"
Cosmetics are essentials for any women and to keep them safe from heat and moisture, we have come up with an effervescent gamut of cosmetic cases. These cases are crafted using finely tanned leather and are finished to perfection by our team of creative experts. We are renowned manufacturer, exporter and supplier of a unique assortment of Cosmetic Bag. These bags are designed using optimal quality tanned leather in adherence with the international standards. Our offered bags are used to store ensemble of cosmetics including mascara, eye-liner, lipstick, face cream, foundation, etc. - This is a multi utility case. - Light in weight and available in variety of styles and colours. - Size, color, logo can be customized as you request. - Wonderful shockproof, waterproof ability! Prevent your cosmetic from harm and wear.